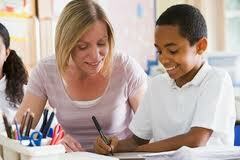 Teaching children creative writing can be a very enriching experience. Children become familiar with stories at a young age when parents read to them at bed time. Teachers who want to start a creative writing program in the classroom can consider these 5 suggestions to start with. 1. Start small. Think of the most basic topic which is common to most of your students. Pets, parents and toys are some examples. Require the students to write 5 fictional sentences about the specified topic. You can have them write these 5 sentences as a story. 2. Dictation. Get a tape recorder and allow each child to tell a story that you record. Do not allow the stories to be more than a few minutes as you will need to transcribe them. On another day read the stories to the class from a paper. This helps the students understand some basic elements for good. 5. Teach character development. Developing characters in a story is easy when done correctly. Teach the kids that the main character needs to be the most likable. Children often have active imaginations which is a necessary part of creative writing. You can get a creative writing program off the ground by first helping the kids come up with ideas that they can identify with. You can use things like dictation and word processors to make the writing easier. "Idea boxes" and character development are ideas that will get the children thinking more creatively. Have fun.